The last time we saw a business model as fundamentally flawed as TrueCar (TRUE: $17/share) was four years ago, when we put Angie’s List (ANGI) in the Danger Zone. In fact, TrueCar today looks very similar to Angie’s List in the summer of 2013, just before the stock plummeted over 50%. Making matters worse, the company ties a significant portion of short-term executive bonuses to Adjusted EBITDA and revenue growth. These bonus targets incentivize excessive stock compensation and wasteful capital allocation. As we’ve shown in numerous case studies, ROIC, not adjusted EBITDA or revenue, is the primary driver of shareholder value creation. Without major changes to this compensation plan (e.g. 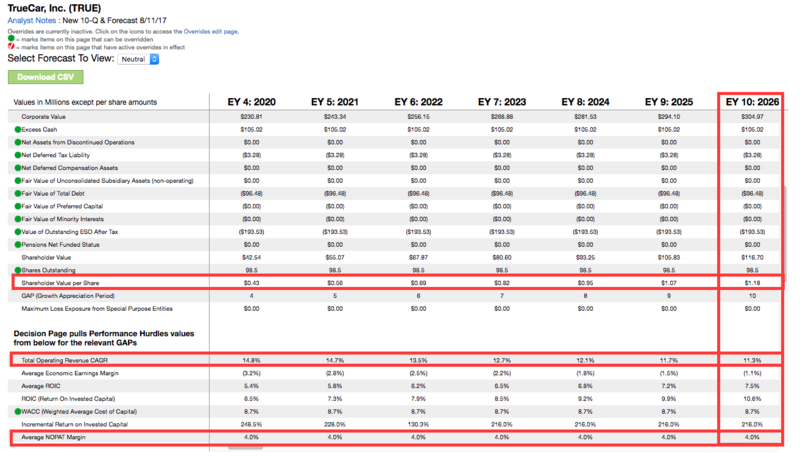 emphasizing ROIC), investors should expect continued value destruction. The best example we have of a company operating profitably as an online middleman between buyers and sellers is eBay (EBAY), which currently earns a net operating profit after tax (NOPAT) margin of 8%. Even if we assume TRUE – which again has never earned positive NOPAT – could immediately hit those margins, it would still need to grow revenue by 25% compounded annually for the next 10 years to justify a $17/share valuation today. Keep in mind TRUE’s TTM NOPAT margin is -5% and consensus revenue growth estimates expect 18% and 14% revenue growth in 2017 and 2018 respectively. If we scale down expectations to a more realistic level, we can see the significant potential downside for TRUE investors. If the company immediately earns a NOPAT margin of 4% – roughly what Autobytel (ABTL) has earned in the past few years – and grows revenue at 12% compounded annually for the next decade, the stock is worth just $1/share, – a 93% downside. 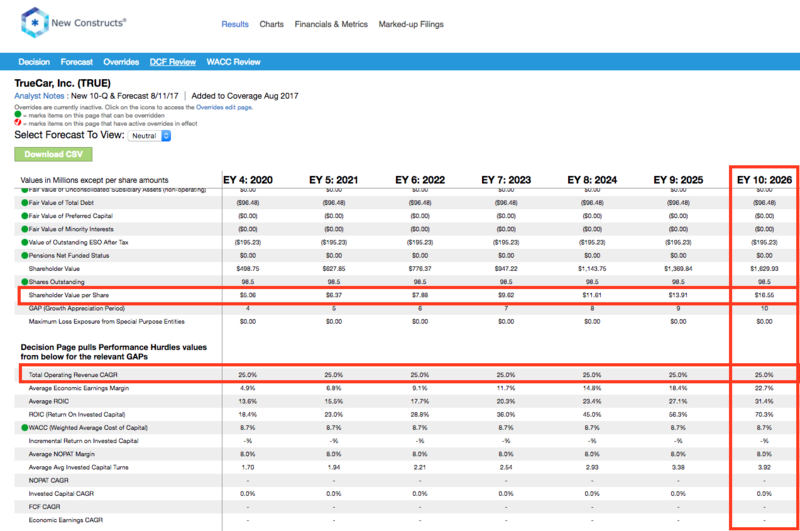 Each of these scenarios also assumes TRUE is able to grow revenue, NOPAT and FCF without increasing working capital or investing in fixed assets. This assumption is unlikely but allows us to create optimistic scenarios that demonstrate just how high expectations embedded in the current valuation really are. For reference, TRUE’s invested capital has grown on average $43 million (15% of revenue) per year over the last two years. TrueCar has a fundamentally flawed business model and unrealistic growth expectations baked into its stock price. The company’s only path to creating shareholder value might be through being acquired by a larger company. The largest risk to our bear thesis is what we call “stupid money risk”, which means an acquirer comes in and pays for TRUE at the current, or higher, share price despite the stock being overvalued. Amazon or some other company looking to break into online automotive retail might see an acquisition as the best way to gain immediate access to thousands of dealer relationships. However, we see an acquisition as possible only if an acquiring firm is willing to ignore prudent stewardship of capital and destroy substantial shareholder value. We’ve previously mentioned two big threats to TRUE’s business prospects. If Amazon enters the U.S. auto market, it could significantly shift the entire landscape. Similarly, if competitors continue to create new affinity relationships, TRUE’s business could suffer. In both cases, the stock price would fall to more realistic levels given TrueCar’s competitive disadvantages. 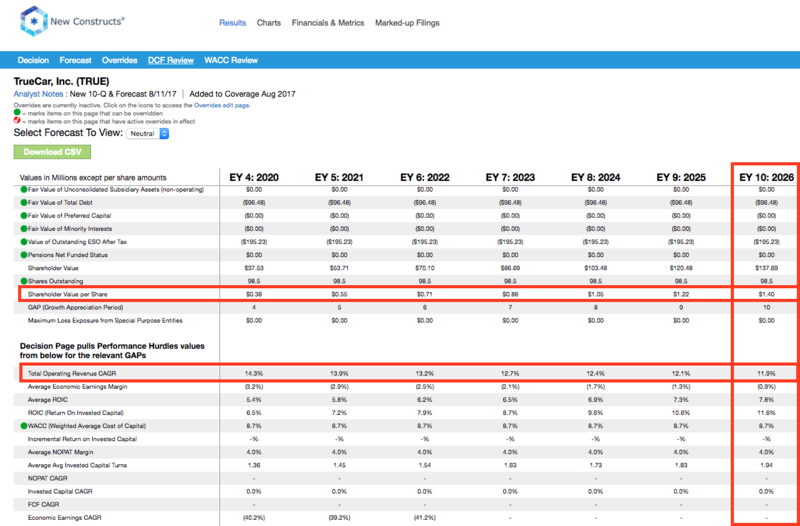 TrueCar does not currently pay a cash dividend nor have a buyback program in place. As such, the stock offers none of the downside protection that a solid shareholder yield can provide. Given the level of risk we see in the valuation and forward expectations, this downside protection could be sorely missed. Income Statement: we made $14 million of adjustments with a net effect of removing $14 million in non-operating expenses (5% of revenue). See all adjustments made to TRUE’s income statement here. 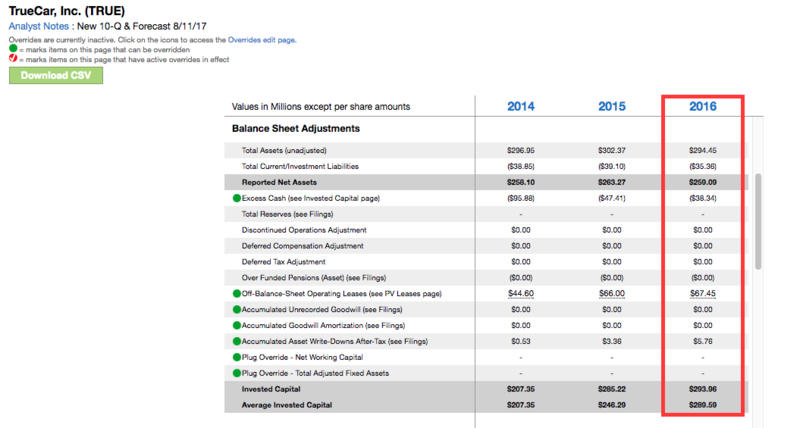 Balance Sheet: we made $151 million of adjustments to calculate invested capital with a net decrease of $4 million. The most notable adjustment was $67 million in off-balance sheet debt. See all adjustments to TRUE’s balance sheet here. Valuation: we made $398 million of adjustments with a net effect of decreasing shareholder value by $188 million. Our largest single adjustment was the removal of $195 million (12% of market cap) in employee stock option liability. TRUE’s significant ESO liability not only limits the upside on the stock, it creates the risk of a death spiral, as a crashing stock price could make employees’ options worthless, and in turn force the company to dilute existing shareholders even further to keep employees on board. The following fund receives our Unattractive-or-worse rating and allocate significantly to TRUE. This article originally published August 21, 2017.